If you’re seeking the golden russet and brown stripes of bubinga, the dark mellow grain of wenge, the bright stripes of zebrawood or the dark sheen of ebony in central New Jersey, Willard Brothers Woodcutters is where you’ll find it. Whether for a table, a cabinet, a bar, or maybe even a guitar, Willard Brothers specializes in both exotic woods and domestics, such as oak, black walnut, maple, poplar or cherry. Located in a woodsy section of Bakers Basin Road at the edge of Trenton, this mecca for fine woodworkers is a third generation family business. Although the company has a website and a Facebook presence, woodworkers want to smell and touch what they will spend many hours crafting an enduring work from. Pass the SavATree trucks and walk into the “showroom” where you’ll see signs for Real Milk Paint alongside rolls of veneer–mappa burl, red oak, walnut and aromatic cedar. Although recently reorganized so that the wood stands vertically for easy viewing, the showroom is much more woodshop. At center is a table made of a flitch (a tree slab with raw edges) with two finely turned wooden bowls on its top. 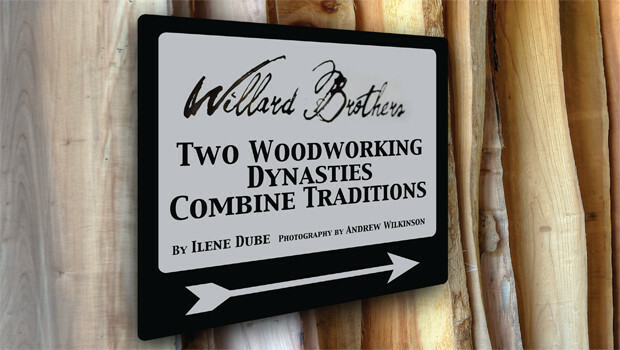 Willard Brothers is a company with a rich history. Sam Willard started a tree service in the 1950s that morphed into Shearer/Penn. A believer in adaptive reuse before the term came into common parlance, Willard expanded into selling lumber and furniture from the trees he took down. He began acquiring land to establish Christmas tree farms in New Jersey and Pennsylvania, and later started Bear Swamp Mulch. Willard was committed to using every part of the tree. What couldn’t be used was ground up and sold as mulch. While delivering ice in the 1950s, he met furniture sculptor George Nakashima (1905-1990). The two discovered a shared reverence for the tree. Soon Willard was bringing wood to Nakashima’s New Hope, Pa., studio. Considered one of America’s foremost furniture designers, Nakashima valued the relationship between man and tree. He published his ideas in The Soul of a Tree in 1981, a woodworker’s reflections on listening to the wood. “Sam loved trees more than anyone I’ve ever met, including my grandfather,” recounted Ru Amagasu, Nakashima’s grandson, who ran Willard Brothers’ furniture shop several years ago. “You can’t believe the kind of weather Sam would go out in, saving trees.” Amagasu would see Willard working the day after major winter holidays, even when he was supposed to be retired. The Princeton Elm, at the corner of Witherspoon and Wiggins streets in the Princeton Cemetery, was the mother for a generation of trees resistant to Dutch elm disease, a scourge that wiped out millions of elms across the country. William Flemer of Princeton Nurseries developed the diseaseresistant strain from the Princeton Elm in the 1920s. When Shearer/Penn was hired to bring down the remains of the 200-plus-year-old tree in 2005, rather than mourn its loss, Willard came up with the idea of turning it into furniture. Amagasu, who’d trained with his grandfather since his boyhood, knew how to use the ancient Chinese and Japanese technique of butterfly joints that his grandfather adapted for decorative use. “Live edge” is the term for the style of dining and coffee tables, developed by Nakashima in the 1950s, that exposes the raw edge of the flitch, or tree slab. Three years ago, at 81, Sam Willard was still working, driving a tractor on one of his farms, when he had a heart attack and died, doing what he loved. Today, the business is run by his sons, Glenn and Steve, and grandson, Matt. Shearer/Penn has been sold to SavATree, and Bear Swamp’s mulching operation is now leased to the Pennsylvania mulching company Victory Gardens. Ru Amagasu no longer works for Willard Brothers, but runs his own furniture making business as a tenant on the property. Brian Millen, who trained under Amagasu, manages the woodworking shop. Millen, who studied industrial design at Rochester Institute of Technology, creates everything from dining tables to Conoid chairs–thus named in 1957 by Nakashima, who designed them for his conical shaped studio. “We take a tree, mill it, and bring it through its final process,” says Millen. “It takes years.” Once a tree comes into the shop, it has to age one year for every inch of thickness. Dry heat may be used to expedite the process. “We’re no longer focused on historic trees,” says Millen. The wood is not always the best to use. And exotic woods, becoming increasingly rarer, are not always the easiest to work with. Willard Brothers is concentrating on local woods, such as locust, mulberry and paulownia, a deciduous tree native to China that has since naturalized in the U.S. Domestic woods are free of allergens, silica, minerals and toxins, Millen adds. “People come with a rough idea and we’ll help them to conceptualize it and sketch it out,” Millen says of his clients, who make the trip from as far away as New York City. “Architects and designers bring detailed drawings.” Sculptors also seek wood– the Digital Atelier in Hamilton has used maple and mahogany for a three-dimensional model—and others are looking for custom woodwork on boats. Paulownia is sought for surfboards and oars because of its buoyancy, and also for stringed instruments. Even telescope makers shop at Willard Brothers. The company was recently featured in Fine Woodworking magazine for a countertop used with Blanco sinks, and had a table at the Philadelphia Invitational Furniture Show. Commissions have included everything from tables and chairs at Princeton Theological Seminary to sample wood for a Japanese car company to replicate synthetically for vehicle interiors. Café Galleria in Lambertville had tables made in burl poplar, and a hostess stand was made with live-edge walnut. Another restaurant in Lambertville commissioned live-edge countertops. Last winter, through Princeton landscape artist Peter Soderman and sculptor Jonathan Shor, a space at the heart of Whole Foods Princeton was dedicated to showcasing Willard Brothers reclaimed wood tables, highlighting how sycamore, walnut and other woods could be repurposed. Not only are the trees memorialized in the live-edge furniture made at Willard Brothers, but so are Sam Willard and George Nakashima, who saw life in the grain of the wood.